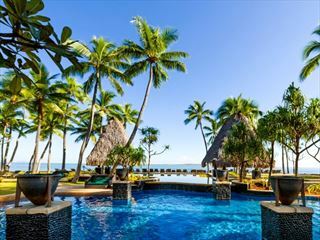 Enjoy a warming Bula welcome at Outrigger Fiji Beach Resort, a breath-taking resort nestled in the heart of Fiji’s Coral Coast on the island of Viti Levu. 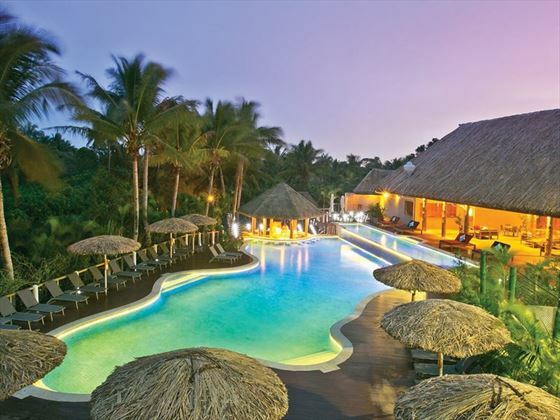 With friendly, Fijian hospitality, delicious food, exciting family-friendly activities and a heavenly spa, this resort is a paradise for families and couples alike. 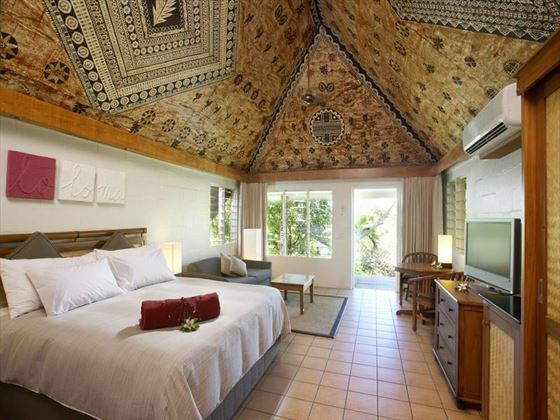 The rooms and bures here adopt a traditional Fijian feel, with quirky artwork and wooden furnishings. The rooms in the main house are gorgeous, but for something a little extra special we love the traditional bure bungalows, nestled either in the gardens or just steps away from the beach and featuring thatched roofs and patterned ceilings for an authentic feel. The tropical pool is the ideal spot to unwind and enjoy a refreshing cool drink, and there are plenty of water sports and recreational activities to enjoy too, should you fancy a break from soaking up the sun. The hotel certainly has families in mind with its two cool kid’s clubs: Little Riggers and Beach Riggers, and the hands-on teens programme including cultural trips and even spear making. Loved up couples can escape to Bebe Spa Fiji, a wonderful, serene sanctuary located on top of what the locals call ‘Heavenly Hill’. 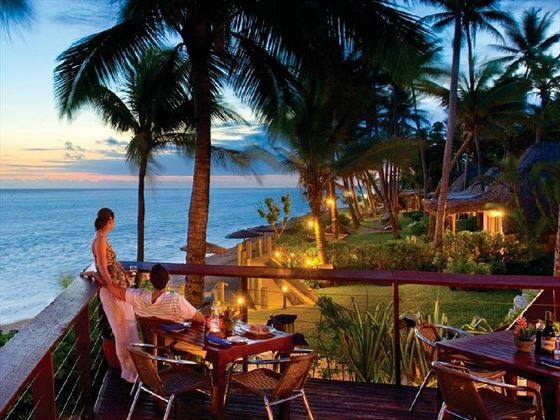 As the evening draws to a close, there are plenty of fantastic restaurants and bars to delve into, including flavoursome Asian fare at the open-air Baravi Restaurant, and weekly themed dinners at Vale Ni Kana. Once the kids have gone to bed, guests will love sipping on signature cocktails at the hilltop KaloKalo Bar, taking in unforgettable views of the ocean. 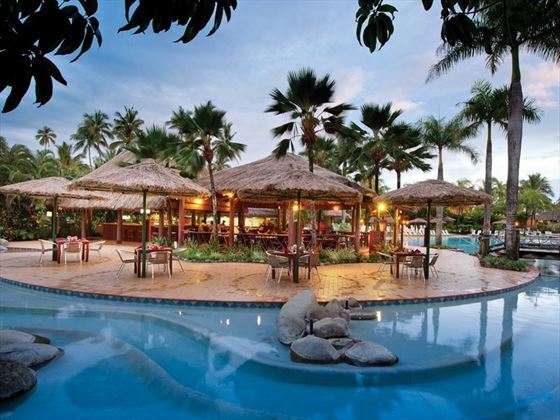 The resort is located in the heart of Fiji’s Coral Coast, nestled amongst 40 acres of tropical landscapes just steps away from the white sand beach. Resort View – Gorgeous 47sqm rooms, featuring one king bed and one double sofa bed, or two double beds. 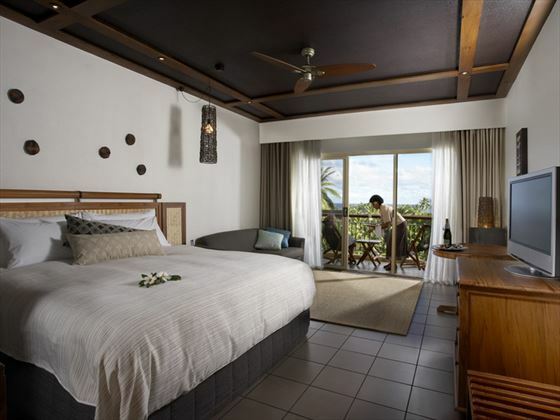 The rooms adopt a modern Fijian charm, and has its own furnished balcony. Sleeps a maximum of three adults, or two adults and two children under 16. Ocean View – Minimalist yet authentic 47sqm rooms, with one king bed and one double sofa bed, or two double beds, and a furnished balcony overlooking the ocean. Sleeps a maximum of three adults, or two adults and two children under 16. 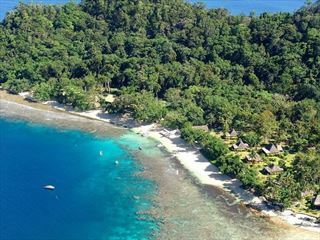 Plantation Bure – With thatched roofs, patterned ceilings and beachside charm, these 50sqm bungalows are very picturesque. Featuring one king bed and one double sofa bed, or two double beds, and a furnished balcony overlooking the ocean. Sleeps a maximum of three adults, or two adults and three children under 16. 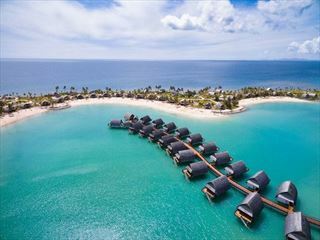 Ocean Breeze Bure – Characterful 50sqm bungalows, again with thatched roofs and ceilings covered in Fijian inspired patterns. Features the same amenities and occupancy as the Plantation Bure, this time only steps from the beach. Sleeps a maximum of three adults, or two adults and three children under 16. 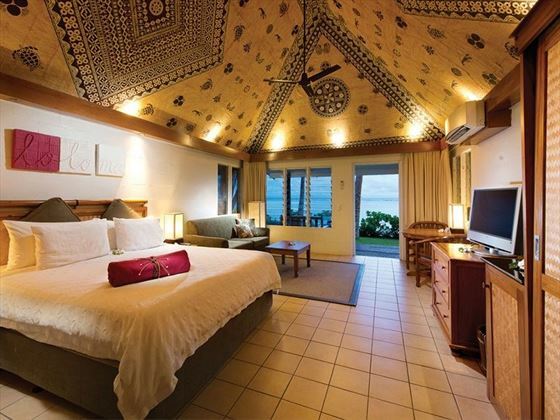 One Bedroom Suite – Adorned with Fijian artwork, these minimalist 50sqm suites are located in the main hotel, featuring a bedroom with one king bed, and a separate living area with a double sofa bed and a single day bed. There’s also an expansive deck overlooking the sea. Sleeps a maximum of three adults, or two adults and three children under 16. 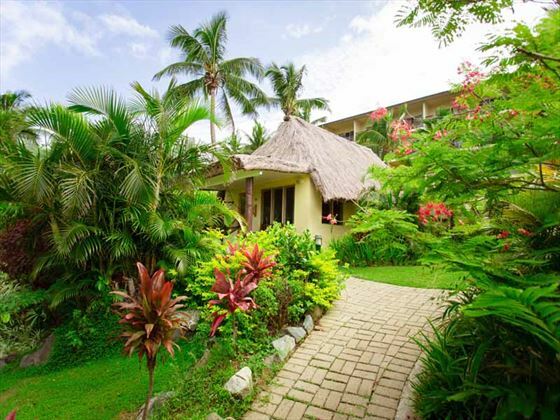 Beachfront Bure – Ambient 50sqm bures with authentic Fijian thatched roofs and patterned ceilings, featuring one king bed and one double sofa bed. You’ll also have a hammock outside to lounge in. Sleeps a maximum of three adults, or two adults and two children under 16. Plantation Family Bure – Spacious 116sqm bungalows perfect for families, featuring one king bed, two double beds and two sofa beds, plus two terraces both adorned with a hammock. Sleeps a maximum of five adults and three children under 16, or six adults. Sundowner Bar & Grill – A laidback restaurant nestled by the ocean, serving up casual lunches, delicious dinners, and gorgeous sunset cocktails. A sumptuous grill of Australian beef, local seafood and wood-fired pizza is on the menu. Open daily 11am-11pm. Baravi Restaurant – With thatched umbrellas perched next to the pool, this open-air restaurant offers a romantic ambience, paired with a flavoursome journey through Asia with an eclectic mix of Indian, Thai, and Chinese food. Open daily 12pm-9.30pm. 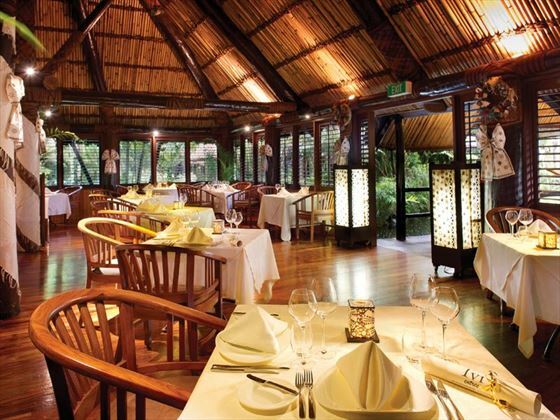 Ivi Restaurant – Located under a high thatched ceiling next to a 100-year-old Ivi tree, this intimate restaurant offers a pleasant evening of formal dining, with decadent Pacific Continental fare and a smart casual dress code. Not suitable for children under 13 years. Open daily 6pm-9pm. Kalokalo Bar – Feel like a star at this gorgeous hillside bar, offering modern cocktails, lavish champagne and tapas with an unsurpassable view of the ocean. Children not permitted. Open daily 1pm-8pm. 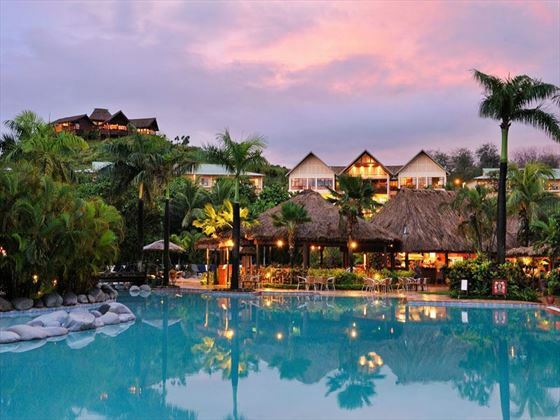 Vale Ni Kana – Located in an authentic bure in the heart of the resort, this fun restaurant offers a wonderful breakfast and brilliant weekly themed dinners with live entertainment. Open 6.30am-10.30am, 12pm-4.30pm, 6pm-9.30pm and 9.30pm-11pm. Takia on the Go – A small café in the lobby, serving take-away sandwiches, pastries and coffees. Open daily 6.30am-6pm. Vakavanua Lounge – A great spot to unwind before dinner, serving tasty tapas and delightful drinks. After dinner, head back here for an evening of live music and specialty cocktails. Smart casual dress code, and no children after 9pm. Open daily 5pm-late. Vahavu Bistro – A contemporary bistro offering a flavoursome tapas menu and pool service. Open daily 5pm-late. 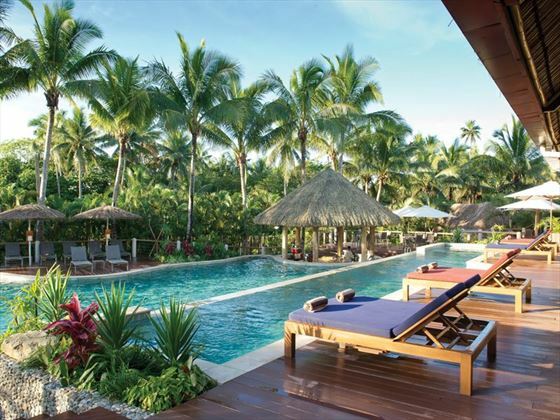 Bebe Spa Fiji – With a name meaning ‘your sanctuary’, it’ll come as no surprise that this beautiful spa is a tranquil haven. 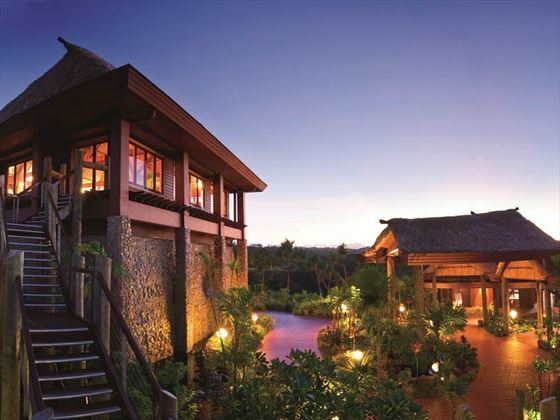 Perched on the hilltop with sweeping views of the ocean, this is a spa experience like no other, offering signature treatments using indigenous ingredients and techniques. The hill the spa is nestled on is known to the villagers as Vakalomalagi Hill – meaning Heavenly Hill – adding to its serene charm. Little Riggers is a fantastic kid’s club for guests aged 3-7 years old, offering fun arts and crafts and supervised activities. Beach Riggers is brilliant for those aged 8-12 years, again offering fun beachside recreational activities, including water polo and Fijian games. The resort’s wonderful Meimei nannies offer a custom-made service for younger guests. 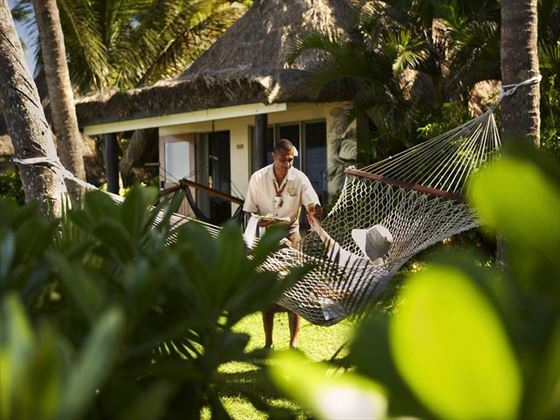 Couples will receive 'his and hers' Outrigger Fiji Beach Resort Fijian sulus & a locally produced Fijian gift/ memento from the resort.